IAS officer Ram Varma’s book is a voyeuristic glimpse into the tribulations forced on the people of Haryana by politicians whom they repeatedly elected. 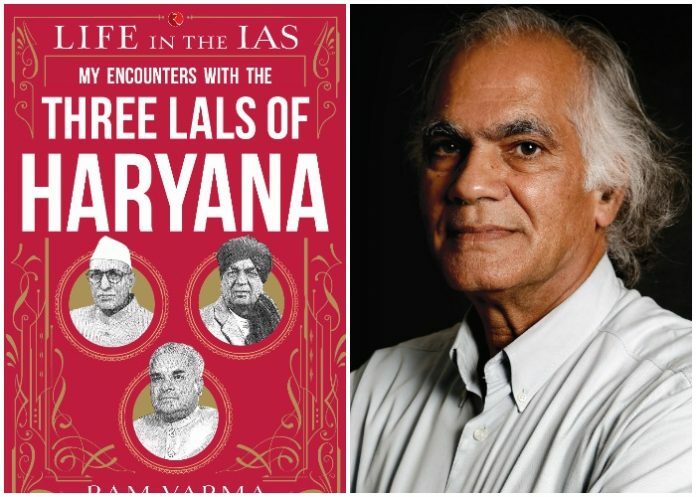 ‘Life in the IAS: My Encounters with the Three Lals of Haryana’ is a strangely honest read. It never claims to be anything more than it is – the memoirs of Ram Varma, a man who enjoyed wielding power and privilege. “I felt like Akbar…” as an entry-level SDM “relaxing on the wide terrace of his palace at Fatehpur Sikri, listening to music and washing down kebabs with draughts of palace wine”. The book takes the reader close to the lives of those corrupted by the money and land they “stole” from the people, lived lives of intrigue, self-preservation, and the promotion of family. The ego of the politician and the bureaucrat often clash throughout the book, but are quickly subsumed by the next phase of mutual exploitation. To the cynical reader, there is little to choose between the two. The book takes us through the political history of Haryana – from its founding in 1966, when Varma joined the IAS, till his retirement as chief secretary in 2000. It contains juicy anecdotes on his close encounters with the three famous political Lals of Haryana – Bansi Lal, Bhajan Lal and Devi Lal – and provides a glimpse into the life within the closed club of the powerful Indian Administrative Service. Varma shares multiple instances of his sense of propriety: ruling against Devi Lal’s relative in 1967 as an SDM, ticking off Rao Birendra Singh’s man, calling the seed farm in Hansi to account, walking out on Bhajan Lal, and in general, saying no to various politicians’ demands. He comes across as an efficient man of action, taking decisions on merit, and not merely on pressure from others, working long hours when required. A notable absence is a discussion on the root causes of state corruption. Varma was there for 34 years, so he hides more than he shares for reasons best known to him. There are multiple instances of special privileges of the IAS, and mutual back-scratching. Varma is either breathtakingly innocent, or just blasé about this kind of misuse of authority. Varma did indeed later purchase a car from the state government quota; we are not informed what he sold it for. In another instance, a Tehsildar finds land for Varma to buy and takes him there, his IAS batchmate (the Haryana registrar of cooperative societies) advises him to buy the land in his wife’s name, and then also proceeds to give the ‘farmer’ wife a loan of Rs 20,000 to buy the land. In 1975, Varma accepts a ‘small gold chain with a pendant’ from Bansi Lal’s wife, happy that he ‘received a present instead of giving one’. Varma is appointed CMD of Central Warehousing Corporation in Delhi because of an IAS joint secretary friend who was “mainly instrumental in my selection”. He travels to Seoul heading the Haryana Olympic Association (“I had never even been a piddling player in my college days”). He goes to Washington D.C. to attend a World Bank meeting for a loan, where he says he contributed zilch: it was “grand holiday at state expense in the beautiful capital of the United States”. There is also a visit to Israel for “developing fisheries” in the landlocked state of Haryana, and a tourist visit to Egypt as a travel bonus. Then, there are the plots of land. “Bansi Lal allotted me a plot at a prime location in Gurgaon which came handy for meeting the expenses of (his daughter’s) two years stay in London”; another plot in a housing society for IAS officers in Sector 42 Chandigarh, which was sold for another daughter’s ostentatious wedding; and at the end of his career, he gets another bonanza – Varma is elected president of a new co-operative society for bureaucrats where he is not a member, and is sent the papers for his membership – backdated! “It came my way unasked,” he says. In Varma’s depiction, Bansi Lal comes out best, Devi Lal next, while Bhajan Lal is not even a footnote. Devi Lal was committed to his rural constituency, implementing populist measures of old age pension and farm loan waivers, and actively spreading patronage to his family. The dynast’s worst gift to public life was Om Prakash Chautala, who was caught at Delhi’s international airport smuggling in wrist watches in 1978. Those of us who live in Gurgaon know how the residential plots along MG Road were converted to malls during his reign as Haryana chief minister. He was caught red-handed in the teacher recruitment scandal, and at 78, is currently undergoing 10 years’ imprisonment, a first for an Indian politician. Varma, almost 80 today, writes a book that is worth a read for those seeking in its pages the hidden world of power, exploitation, false prestige, and genteel corruption. Or even just those who want a voyeuristic glimpse into the tribulations forced on the people of Haryana by politicians whom they repeatedly elected. Harsh Singh Lohit is the founder and curator of Chaudhary Charan Singh Archives.